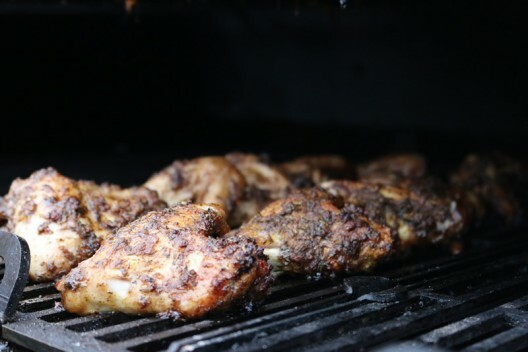 Jerk is a style of cooking native to Jamaica in which meat is dry-rubbed or wet marinated with a hot spice mixture called Jamaican jerk spice. Jerk seasoning is traditionally applied to pork and chicken although I have also done it on turkey and goat. This is my attempt to recreate my favourite Jerk from the JerkPan BBQ Co.
Start off by making your dry rub by combining all of the rub ingredients. You then need to put all the marinade ingredients into a food processor and mix until it forms a runny paste. Make sure you only use 4 tsp of your rub as you will need the rest later. Mix your wings in the marinade and allow to sit for about 24 hours in the fridge. At least 24 hours later set-up your BBQ for indirect cooking at around 150C/300F. Remove your wings from the marinade and cover it with a light sprinkle of your rub. Now place your chunk of smoking wood into the fire and put the wings in the BBQ. Cook them indirect until they reach an internal temperature of 74C/165F. Once they have reached their correct temperature finish them off direct for a couple minutes each side.